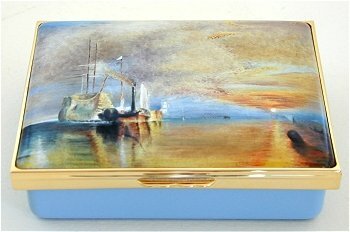 A beautiful box to mark the bicentenary of the birth in 1806 of one of the world’s greatest engineers and prodigious builder of bridges, tunnels, railways and steamships Isambard Brunel. The son of a distinguished French engineer, Brunel first worked on the Thames Tunnel for his father. As chief engineer of the Great Western Railway, he constructed some of his most impressive engineering works on the line between London and Bristol. 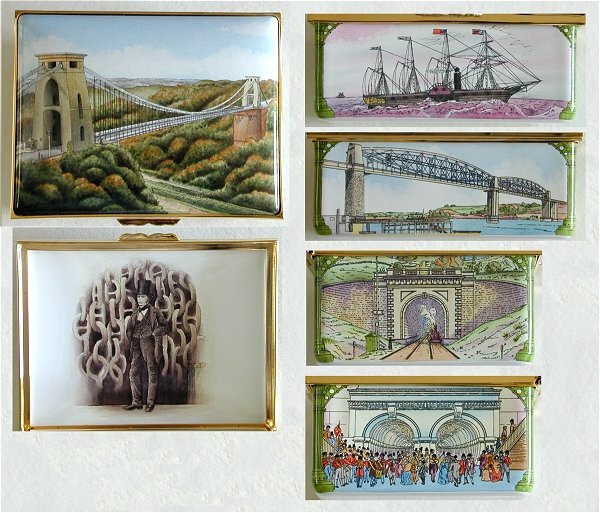 This handsome box features the Clifton Suspension Bridge, whilst on the sides are the Great Western steamship, the Thames Tunnel, the Royal Albert Bridge and the Box Tunnel. Inside is the famous image of Brunel on the site of his last great shipbuilding project shortly before he died in 1859. 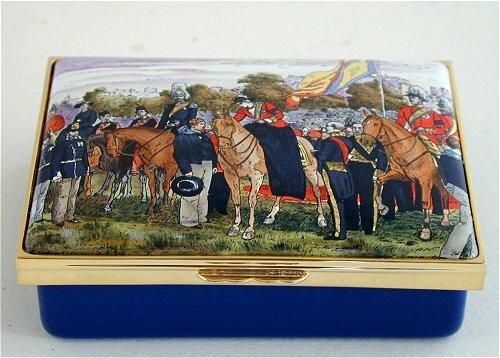 Please click on photo to see the large image that shows all the side of this splendid box. To commemorate the bicentenary of the birth in 1806 of one of the best-loved English poets. 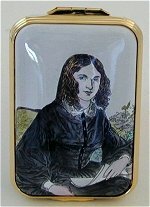 Elizabeth’s courtship and secret marriage to Robert Browning, in defiance of her domineering father, is one of the most romantic love stories in literary history. 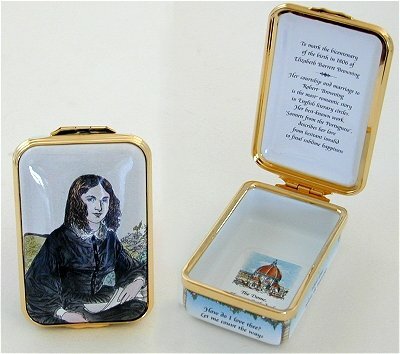 Inscribed around the base of this elegant box are poignant lines from her poetry, including those from her most famous work, Sonnets from the Portuguese, dedicated to her husband: How do I love thee? Let me count the ways.Inside the base is a view of Florence, where she and her husband settled after their marriage and where she died in 1861. Joseph Mallord William Turner’s dramatic painting of 1839, in the National Gallery, depicts The Fighting Temeraire being towed by a steam tug up the River Thames to Rotherhithe to be broken up in 1838. The old warship played a distinguished role in Lord Nelson’s victory at the Battle of Trafalgar in 1805 and her last voyage up the Thames attracted crowds of spectators. Celebrating the 150th anniversary of its institution in 1856. 'The Queen Distributing the first Victoria Crosses in Hyde Park, 26 June 1857', by George Houseman Thomas. The historic scene is replicated in exquisite detail, each box taking approximately eight hours to paint. 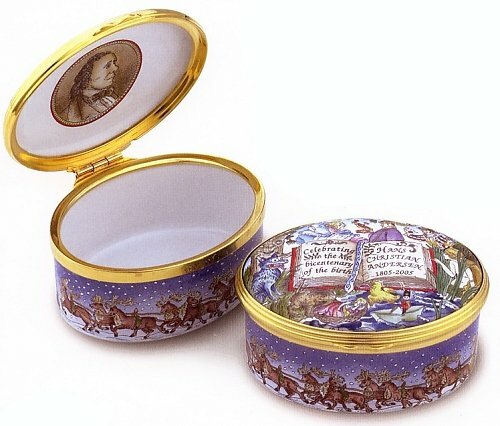 A wonderful box featuring scenes from his wonderful stories. Click to see the larger photo showing the deteails.